Right now we’re currently anchored in Snug Harbor where we can borrow internet from the mainland and I couldn’t resist signing on and forwarding some pictures. I’ll have more details to come since internet access is limited and I have tons of work to do, but I had to share the potentially best day I’ve EVER had. Let me name the reasons: an incredibly gorgeous sunset last night segued into a peaceful, foggy morning today. 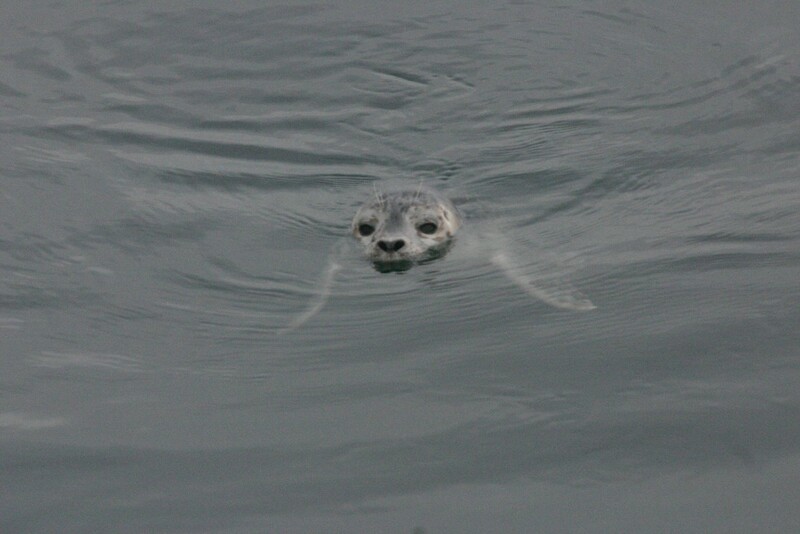 We started our day seeing minke whales and an adorable baby harbor seal swimming around the boat, and trying to climb up our back stairs. 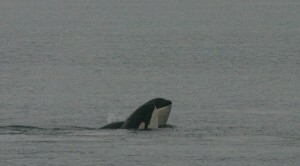 We moved on to see orcas, lots and lots of orcas! My favorite part was seeing a mom and calf interact and play around–it was amazing to see how curious and playful the calf was! Plus we heard orcas vocalizing in AND out of the water and saw so many(/much) peck flaps, tail slaps, spy hopping, breaches, playing around, nuzzling, familial bonding…The Southern residents were definitely out and about! Our day ended with a stellar sea lion and both Harbor and Dahl’s porpoises, who were bow riding on another boat, on our way back. To top it all off? Mac and cheese and chocolate chips this evening! Seriously. You cannot top the day we had with the marine wildlife, especially the orcas. They are clearly such intelligent and playful animals, I’m continually amazed and awed and inspired by these beautiful creatures. I cannot believe this is my life right now. Sorry I just word vomited out this amazing day. Everyone has been getting some great data for their projects, and I just couldn’t keep this day to myself! Today was our first full day on the Gato Verde. Despite being bookended by fog (pea-soup in the morning and thin, wispy, romantic fog out of a painting in the evening) , we did find a little bit of sunshine in the middle of the day. The big benefit of fog is that it is often complemented with still water. In fact, we have yet to test the sea-worthiness of our stomachs as we had an entire day of completely smooth water (really like glass). Who knew the ocean could be like that? The disadvantage of fog is, of course, that it makes it hard to look for whales. Harbor seals, Stellar sea lions and porpoises all made appearances close to our vessel, but all reports indicated that our neighborhood orcas were off in international waters. Luckily, being bioacousticians, we were able to listen for whales as well using our hydrophone array and our fancy new high-frequency hydrophone. Alas, there was nothing but engine noise to be heard. * However, now that our equipment has been properly tested and proved itself to be up to the challenge of dealing with the rigors of the sea, we will be ready for the appearance of our lovely black and white friends on the morrow. Of equal importance to the knowledge we gained about our hydrophones was the knowledge we gained about seamanship today. Not only did we learn about luffs and leeches (parts of a sail) but practiced our bowlines and half-hitches and sheet bends as well. We are in good spirits, well fed and learning a lot about each other, about whales, about research methods and about sailing. And, as we head to bed tonight, we are treated not only to cold, clear skies and a million lights above us, but also to cold, clear waters and a million lights (via bioluminescence) below. Be there wind or be there whales tomorrow, we’ll be ready! *Not our engines, however. We found out today why Captain Todd named our boat the Green Cat. It turns out that running on a combination of wind power, nearly silent electric motors and a bio-diesel generator that is not attached to the hull is not only good for avoiding disturbing the wildlife with noise, it’s also good for the environment by reducing emissions and using zero petroleum products for locomotion or cabin electricity. Although the rain made the logistics of loading the boat more difficult and Todd faced 25 knot wind as he departed Bellingham, the Gato Verde made it to the FHL dock just afternoon and we departed just a few hours later. Everyone got a chance to steer as we worked our way south into Griffin Bay where we anchored for the night and enjoyed some award-winning chili and corn — no wait — oatmeal bread for dinner. A highlight for me was watching the skipper of a 20′ scow row his boat past us using a yuloh — a stern oar that is swept side to side like a fish tail. Made of Douglas fir and almost as long as the boat, the oar was mounted in a horse-shoe shaped oar lock on the transom and the end of the loom was held down by a lanyard. Without working hard (not even holding the end of the oar) they made 1-2 knots past us and then set an anchor and boom tent. The yuloh is another nice way to move oneself sustainably across the planet, one that is simpler than our biodiesel-electric propulsion system, but certainly less powerful and able to make a schedule. Of course, it might be hard to keep up with the southern resident killer whales using yuloh power… and our 12 kg electric motors and 14 kW biodiesel genset are a grand improvement over the dual 27 horsepower inboard diesels that we started with in 2005! The beautiful sun was shining and the tides were cooperative today for a lovely day on the water. Unfortunately, the whales did not agree and stayed away from the Strait (and everywhere in the Northern inland waters) again today. I am crossing my fingers that they make an exciting appearance tomorrow morning directly off our bow sprit. Other animals seemed to enjoy the day, and we were able to watch a number of porpoises play in turbulent waters just off Turn point, some harbor seals napping at high tide on a reef too flooded to be relaxing, and various birds surrounding us all day. We watched cormorants eat skinny silver fish (and thought in awe of the research that gathers data on the species that a bird eats) and seagulls noisily chase each other down while the rhinocerous auklets were focused on diving to the depths. The group had great discussions about the complicated methods in behavioral science and hashed out details for when the whales arrive. With our hearts full of laughter and sunshine, we set off to Wescott Bay to watch the harbor seals play and listen to the orchestra of birds just off our bow. And of course, to fill up on fried rice. The weather today started out cold but became very nice. We tried to pump out at the barge in Reid Harbor, but it wasn’t working so we decided to go to Roche Harbor instead. Before we left, Jason got on the dingy and fed the plug end of the single hydrophone up through the drain for the recycling area so we have an easy deployment of a hydrophone. At Roche we pumped put, filled the propane tank and bought milk, and then were on our way. We drifted down the west side of San Juan Island till about 4:00 when we turned around so we sould make it back to Snug in a reasonable time. While we were drifting we decided to re-try the lightbulb implosion experiment and had much more sucess this time. There were no waves or dodging ships. The 100m test went of beautifuly. The imploding light bulbs made a great sound, kind of like a gunshot. The first snag came on the next test at 200m. The recorders heard 6 sounds and stopped the recording but two of the sounds were taps where the smasher got stuck on the lightbulbs and shortly after stopping the recording we heard a great implosion. The next test was another at 200m and this one set the tone for the rest. It didn’t go as well but good data came from it. All three tests at 400m had problems, but between the three there was usable data. After we pulled up we headed back to Snug Harbor for the night. Finally the winds died down enough for us to venture forth into Haro Strait again to look for whales and conduct other research. We enjoyed some breezes in the morning and rode the flood time up to Turn Point on Stuart Island where we positioned ourselves to watch and listen for killer whales. Val came aboard this morning in Snug Harbor which allowed us to have mentor meetings with both Val and Jason and all to iron out some more of the wrinkles in research methods. Science always makes its best progress when multiple minds focus on a problem and discuss the matter at hand. During the day we were graced with sightings of a number of porpoises, including two different sightings of around 3 Dall’s porpoise in the area of Turn Point. This was a real treat as we have not seen many in these waters during the last several years. After a wonderful dinner at the dock in Reid Harbor we revisited our calibration exercise to make sure we all understood the process and decide which the most appropriate calibration factors to use were. Nothing like an invigorating discussion of logarithmic decibel scales around the lounge of the Gato Verde to end off the day. We bunkered down in snug harbor today and didn’t even bother to stick our noses out into the Strait. The small craft advisory and warnings of gusts up to 60 mph kept us away and content today. The sun was shining although the wind was blowing, and we were able to avoid all sea-sickness by avoiding everything other than our lovely harbor. We discussed various methods of taking data and send Jason out in La Gatita to pretend to be whales behaving in several manners while we took recordings.It was quite entertaining to see the dingy bouncing around in the harbor and catching enough wind to almost send Jason into the brisk water. Luckily, he made it back just in time to start dinner. Being the responsible one on board, he was sure to serve broccoli, beets, and polenta-lasagna. 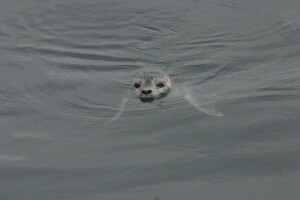 Oh, we did spot a harbor seal taking a few breaths and resting at the surface just a few meters from the bow. So there’s the reported science from the day. Other than that, we worked on papers and read several scientific articles between the five of us. I think that if you combined all of the knowledge that our brains host, you could form a small acoustic and marine mammal behavioral library.